SUSE SLES11 内部イントラ用ＤＮＳサーバが動かない。ＹａＳＴで設定して、bind を再起動しても反映されない。 Bind never resolve intranet hosts on SUSE Linux. ゾーン全体が反応しない。 Hole of zone could not resolve. Aug 4 09:34:34 dns2 named: zone intra/IN: not loaded due to errors. 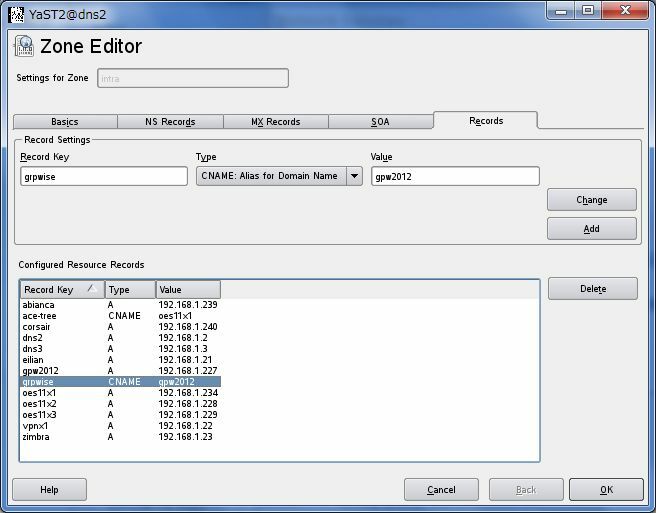 Delete duplicated CNAME alias from master recorad. Works fine ! ace-tree.intra. 172800 IN CNAME oes11x1.intra. oes11x1.intra. 172800 IN A 192.168.1.234　<-　正しく帰ってきたようだ ^_^ ! intra. 172800 IN NS dns3.intra. intra. 172800 IN NS dns2.intra.